NTK Hunter GT 5 to 6 Person Tent is a fully freestanding one-door tent with fiberglass poles and a very high waterproof rating for 2 to 3 season use. NTK HUNTER GT 5 to 6 Person Tent. This NTK GT tent is available on Amazon. They usually have the best shipping service because of the stores on several continents, so you can save on shipping. You realize from the picture that this is a typical dome style tent, and a simple freestanding structure. 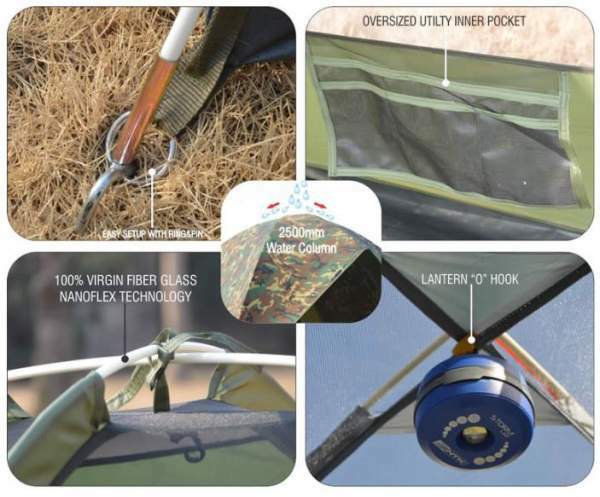 This means that the tent is self-supporting and you can rotate it and move around even after you put the fly on. This is because of the fly structure which is without vestibule and it attaches to the corners with buckles. This is a part of a new series by NTK, the largest in the group is their NTK Hunter GT 8 to 9 person tent. So here you have colors that are quite different from their standard color used in many of their previous series, see for example their Omaha GT 6 tent or Super Arizona GT Tent. 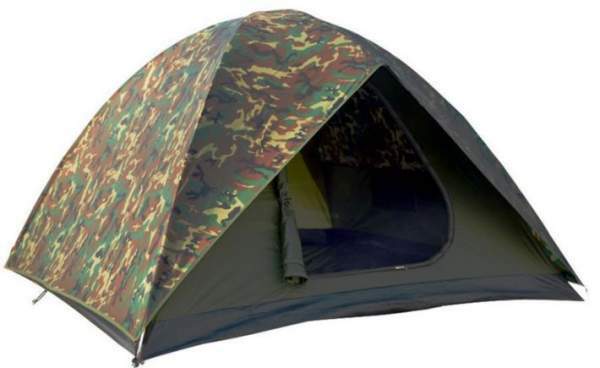 But overall features and materials used for the Hunter series are similar to their other tents. Single door structure with lots of mesh. Space-wise, the tent offers 96 ft² (8.9 m²) of the protected area. For 5 users this would give 19 ft² (1.8 m²) per person and this looks a lot. You will see in the comparison table below that it offers more space than some of its 5-person competitors built in the same style. But there are no vestibules so you have to keep the stuff inside. Assuming that this would be used with a car, you can keep the gear in the car and the size would be enough. But for six users this is a too small tent. I see it best suited for couples or for parents with one kid. The picture below roughly indicates the external dimensions. The most important external dimensions. Seasons-wise and climate-wise, they describe it as a 3-season tent but I see it as a tent for 2 seasons and this is because of the following. There are big mesh areas on the two sides and on the top, you have seen it in the picture above. This is great for warm weather but not so great in a cooler environment. The tent has a small awning above the door. This allows for views around and you have an easy access, but in the case of strong winds this can make the tent unstable. So this structure is better suited for calm areas and don’t take it above the tree line. Use some of these tents with full coverage fly for such an environment. The weight of 15.2 lb (6.9 kg) is quite moderate and similar to its competitors, see the comparison table below. It can be carried to some shorter hiking tours but I see it more as a camping tent, and this is how the manufacturer describes it. They write that this is their premium line of tents, but the poles are fiberglass. This material is used in many tents nowadays, see more here, even in rather expensive models by Vango. But this is not a particularly durable material, just to know, and this is partly behind such an affordable price of this tent. So you have them 2 only for the dome plus one shorter pole that creates the brim above the door. They are shock-corded as usual and with chrome plated ferrules. You have a pin and ring system shown in the picture below, so the setup is easy. Some of the most important features are presented in these pictures. The inner tent and the fly are built from a 190T polyester laminated with polyurethane that offers 2500 mm waterproof rating. 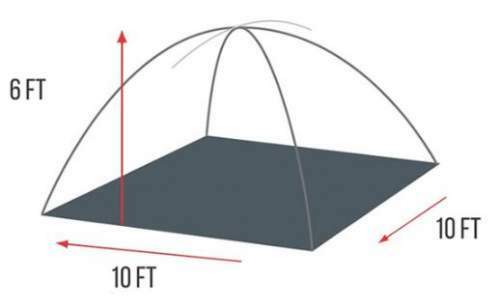 Large portions of the inner tent is a no-see-um micro mesh. The floor is a heavy-duty seamless anti-fungal polyethylene, there is no indication about its waterproof rating but it is likely more than in the fly so you are safe from this side for sure. Note that this is a bathtub-style construction. The seams are heat-welded. The materials meet CPAI-84 flammability requirements. You have one door only but it is large and with a 2-way zipper, see below. Inside you also have a utility pocket shown in the picture above. Two-way zipper is on the door. They write about ‘ventilation enhancement’ but the tent has no floor vents. Though the mesh panels on the sides go far towards the floor so you should have enough ventilation even if you have to keep the door protected with the panel. Note that the window on the door is quite protected and you can keep it with the mesh most of the time. *This is in the case of 5 users. Declared capacity: 5 – 6 people. Weight: 15.2 lb (6.9 kg). Dimensions: 9.8 x 9.8 ft (298 x 298 cm). Area: 96 ft² (8.9 m²). Area per person (for 5 users): 19 ft² (1.8 m²). Peak height: 69 in (175 cm). Packed size: 27 x 8 x 8 in (69 x 20 x 20 cm). In the table below you can see how this tent compares with two 5-person tents from some other brands that are built in a similar style with a partial fly. This may help in understanding its features. All are with unrealistic declared capacity. So the NTK Hunter GT 5 to 6 Person Tent is an easy to use construction with a great waterproof rating and with an equally great price tag. This is a reliable tent but it is best to ignore the declared capacity. More protection you can expect from their Omaha GT 6 tent because of its full fly. If you need more options, please check in the category Tents for 5 & 6 people here in the site, you will find them many. You might want to check this Therm-a-Rest Tranquility 6 Person Tent with its two rooms and nice vestibules. Yet another in the same tunnel style is this Exped Ursa VI Tent which is, in fact, freestanding, how unusual for a tunnel tent. If you need a tent with integrated lighting, please check this Big Agnes Titan 6 mtnGLO tent. Note that this is not a sponsored text and I am not paid by the manufacturer. Please bookmark this site and visit from time to time, new content is added here regularly. Use the comment box below in the case of questions or comments. Have a nice day.